Move it Up a Notch! Medium hikes are great for those looking for a little challenge. They require more endurance than a short hike. To build up to hiking medium hikes, increase the distance you hike gradually. For classification purposes, all of the medium-length hikes included on this page are 4-9 miles long. Cucumber Gap Loop This is a great hike for those who like variety. It's a great well-rounded hike, not too long or short and something for everyone. You start off seeing some historic buildings on Jakes Creek. 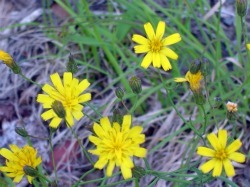 On Cucumber Gap you'll enjoy wildflowers and ridge hiking. You'll end with a pleasant stroll down Little River Trail with the soothing sounds of the river to carry you back to your car. This hike is near Elkmont and the total length is 5.5 miles. Abrams Falls This is a beautiful waterfall located off the Cades Cove Loop Road. It's also an easy gently-sloping trail. The total hike length is 5 miles. Rich Mountain Loop This 8.5-mile loop offers views, wildflowers, and some history. There's also a small waterfall as a bonus. It's a nice break from the crowds down at the Cades Cove Loop Road. It's not an easy hike, so be ready to climb! Chestnut Top This hike is 4.3 miles one-way and has lots of wildflowers. There's also a neat-looking hollowed out tree along the trail. This hike is near the Townsend entrance. Ramsey Cascades This is my favorite waterfall hike because of the challenge and the falls are the highest you can get to by trail in the whole park. It's 4 miles to the falls, making for an 8-mile roundtrip hike. Ramsey Cascades Trail is located near the Greenbrier ranger station. Little Cataloochee Trail If you love history, you'll love this hike. You'll see a school, a couple of cabins, and a church. It's 5.9 miles one-way from Cataloochee Campground to Cove Creek Rd. If you're not up for backtracking, you could arrange for pick-up at the end. Silers Bald Silers Bald is an enjoy-it-as-you-go hike along the Appalachian Trail. There are great views along the trail so don't worry if you don't make it to the bald. If you do, it's a 9.3 mile roundtrip hike. This is a very popular hike along the Appalachian Trail. Tackle Charlies Bunion on a clear day to make the most out of it. There are views along the way too even if it's smoky at the bunion. It's 8.1 miles round-trip.